Desirable East Lake Woodlands stunning 3-way split floor plan home that features 4 Bedrooms PLUS a Den and 3 Full Baths located in gated Cross Pointe subdivision. The volume ceilings make the home light and bright. The tastefully remodeled gourmet kitchen features custom Thomasville honey maple cabinetry and granite counter tops that joins to a cozy family room with a wood burning fireplace all overlooking the screened in lanai and pool. The Master Bedroom suite features private access to the pool with room for a sitting area and 2 walk-in closets. The luxurious Mater Bathroom has travertine floors and shower granite counter top and a garden tub. The large private back yard has ample room for kids to play. The oversized side-entry 3 car garage has lots of storage room. New Tile Roof 2011 and no Flood Insurance required. A-rated schools. East Lake Woodlands is a gated community with two 24-hour manned gates and 24-hour roving security. Enjoy the many extras that East Lake Woodlands Country Club membership has to offer with two 18-hole golf courses tennis courts pools Clubhouse dining gym and much more.! 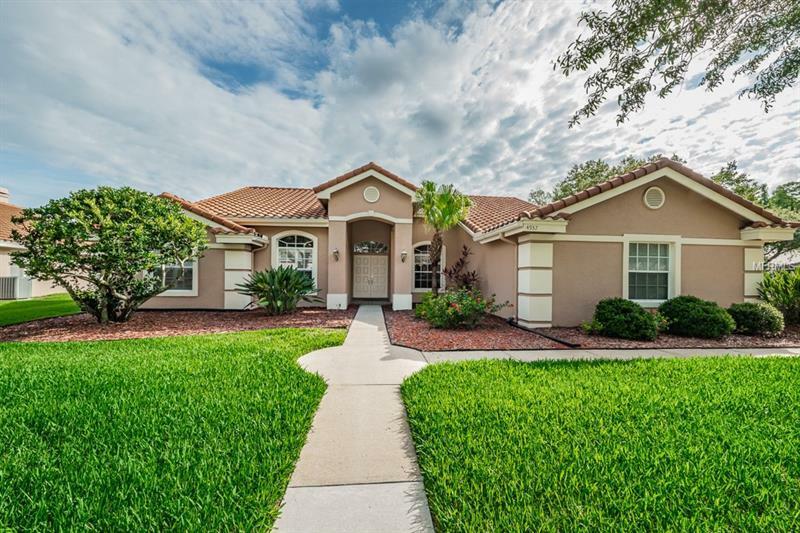 Close to shopping Gulf coast beaches and 25 minutes to Tampa International Airport or Clearwater/St. Pete Airport. Master bedroom drape does not convey! A $5000 credit toward a new AC at closing. SEE VIRTUAL TOUR FOR ADDITIONAL PHOTOS!